Bette from Chicago, brought the 1906 Steiff teddy bear to the teddy bear show in Schaumburg, IL. The bear was a gift from her sister's estate. 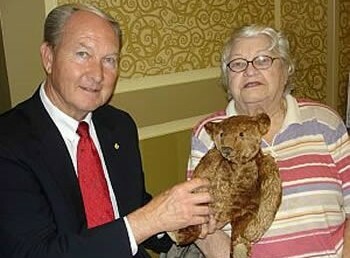 Bette wanted to know the bear's value and Ken Yenke, a renown teddy bear appraiser gave her an appraised value of $5,000.00. "I want to sell the bear because it is time for the little bear to find a new home," she said. Look for Ken and Brenda Yenke at many of the Bright Star Promotion's shows and at other shows too. They often speak at civic organization or appear at antique shows where you can bring your vintage collectibles for an on-the-spot appraisal. 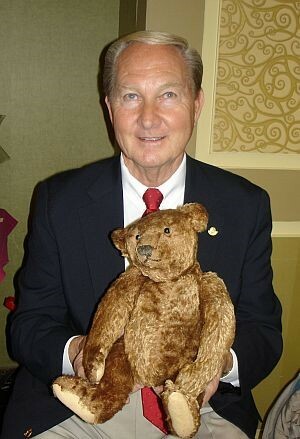 Ken writes about antiques in the Cleveland Sun Newspapers, author of several teddy bear books and is the curator of the Chelsea Teddy Bear and Toy Museum. Read more about Ken. 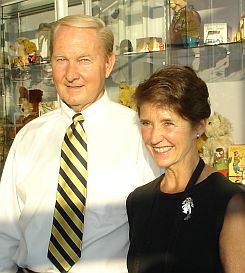 Bette saw the newspaper advertisement for the Schaumburg Teddy Bear show and the part about Ken appraising bears. She responded and was thrilled to meet Ken. 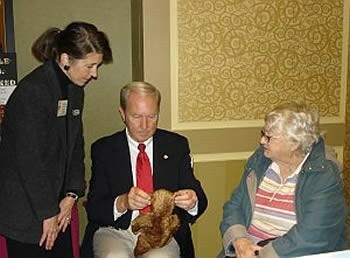 He told her all about her bear and since she wanted to sell it Ken suggested Valerie sell it for her on eBay. 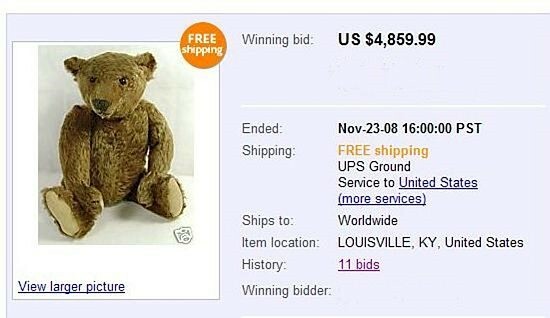 Bette gave the bear to Valerie and it sold for nearly $4900.00! "I was a little worried when we didn't receive any higher bids with 30 seconds left to go, but that last 30 seconds was something to see!" Bette exclaimed.